Chesta or gesture is also a source of new knowledge. For example, we know that a dumb follow is hungry by the gestures that he makes. We also come to know the thoughts and feelings of other people by their gestures and postures, i.e. by their bodily expressions. The Naiyayikas do not regard it as an independent source of knowledge. It is a kind of inference in which a sign (linga) gives us a knowledge of something else signified by it, their relation of being the sign and the signified having been discovered through repeated experience. I agree with the Nyaya school and others that Chesta is reducible to Anumana or inference. So my question is, what are the Shaivite or Shakta arguments for Chesta not being reducible to any other Pramanas? By the way, the Shaiva Siddhanta philosopher Arulnandi Sivacharya accepts the same three Pramanas as the Vedanta school; see this excerpt from his Shivajnana Siddhiyar. So it seems that not all Shaivites and Shaktas believe in nine independent Pramanas. Does anyone know which Shaivite or Shakta sects do believe it? 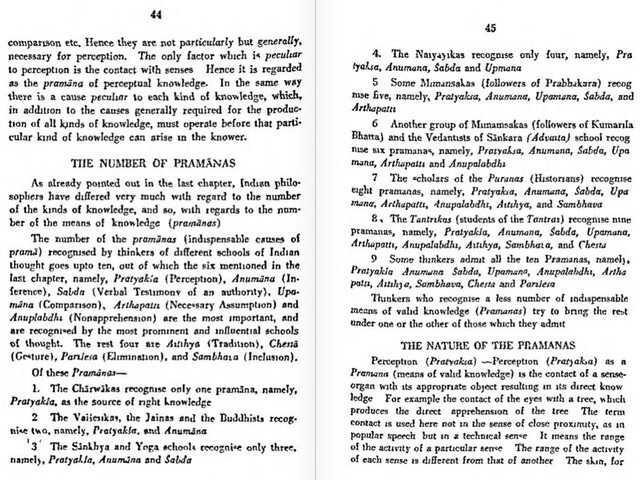 EDIT: This excerpt from Kaundinya's commentary on the Pashupata Sutras recognizes the same three Pramanas as the Vedanta school. So it looks like neither Pashupatas nor Shaiva Siddhantin believe Chesta is an independent Pramana, which makes me all the more curious what Shaivite or Shakta sect believes in Chesta as an independent Pramana. Browse other questions tagged philosophy shaivism agamas sects shaktism .